ONE SUMMER NIGHT by Caridad Pineiro Review Tour! It’s release week for Caridad Pineiro and her newest contemporary romance, ONE SUMMER NIGHT. Follow the tour for reviews, excerpts, and enter to win a $100 Amazon gift card and three runner-ups will win ONE SUMMER NIGHT branded T-Shirts and Hats. 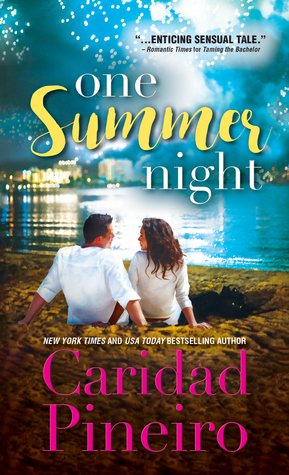 What happens at the shore, stays at the shore in Caridad Pineiro’s contemporary romance, ONE SUMMER NIGHT. Maggie Sinclair is out of options, and Owen Pierce, life long neighbor and enemy has an offer that’s impossible to accept. Fans of Bella Andre’s Sullivans series and Shannon Stacey’s Kowalskis series are sure to love this light and playful enemies to lovers romance. Enter to win a $100 AMAZON Gift Card and (3) Runner-ups will win a ONE SUMMER NIGHT Branded T-shirt and/or Hat! Thanks so much for being a part of my release week blog tour!